I like the Protein Works, as a UK company they are really pushing the innovation on what may be considered a stable product for many. While there are dozens of protein manufacturers out there, this company really pushes for competitive price, clean label ingredients and most of all, interesting flavours. I tend to prefer whey isolates, as it has reduced lactose content and the most protein per gram; one 25g scoop provides 21.9g of protein. 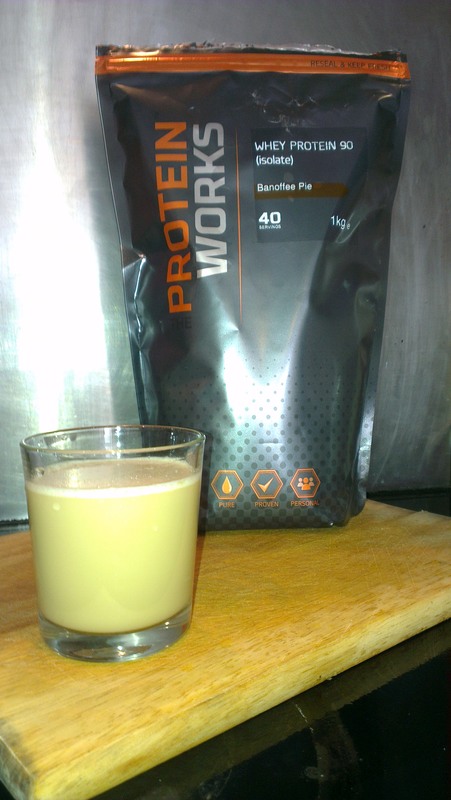 The protein works offer 500g, 1kg, 2kg, 4kg and 6kg sizes. Larger sizes give better value as you would expect. I find the 1kg sizes offer good value, balanced with the opportunity to regularly try different flavours, which is important to me when a post workout shake is a daily staple, things can lose their appeal fast. This whey mixes smoothly with coconut milk which is my preference, so I expect it will also mix fine with water or milk too. The packaging suggests 150ml-200ml liquid per single 25g scoop; I tend to have 2 scoops mixed with 50g dextrose and 300ml coconut milk as a post workout recovery shake. It is flavoured with natural banana and toffee flavourings and sweetened with sucralose. Sucralose is the sole sweetener used on all products by the protein works, this is in my opinion the best artificial sweetener, it tastes great and research indicates it is not metabolised by the body and doesn’t carry the negative aspects that some of the other sweeteners can bring. This is hugely important to me in my protein purchases. As for the Banoffee Pie flavour? This is where I feel this product fails. I perceive a dominant banana flavour ,the toffee is very weak and I dont think the balance is quite right. The protein works offer a Banana only flavour option and i’d be curious as to how much it actually differs from this Banoffee Pie flavour. For this reason I would likely not buy this flavour again, however as a Whey Isolate, this is my go to product from now on, I’ve tasted some of the other flavours and they are fantastic, and I expect they will continue to offer new flavour options as time goes on.